Channel Nine will air the controversial American game show that sees contestants divulge home truths to their partners, after being hooked up to a lie detector prior to the show. 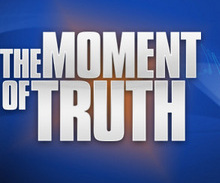 Moment of Truth will air from 7:30pm Tuesday March 11. Despite promising a local version of the series sometime this year, Nine will lead with the US version, hosted by Mark L. Walberg. The controversial show is based on a Colombian format (an episode of which saw a woman answer yes to the question “Did you pay a hit man to kill your husband?”). Answering each question in sync with the responses recorded via a polygraph sees contestants progress to the next question towards a $500,000 prize. A false or unanswered question results in a loss. Following American Idol the show has had big audiences in the US, but poor reviews. This week it attracted controversy for possibly breaking up a marriage when a married woman was asked by her ex-boyfriend whether she should be married to him. The show’s executive producer, defended the show, saying they investigate every contestant thoroughly. Get ready for Jerry Springer meets Millionaire. Why do we have to put up with these shows???!!! Do you really want to know the inner working s of couples. How much has Channel Nine lost the plot. No Footy, No Underbelly, sub standard shows…Temptation off, then on, then off, then eddie, then on. Make a goods decision soon Channel Nine. Oh, dear. Do we really need this? Another version of Jerry Springer, only this time with electronics? They’re really running out of ideas. The local version has already been officially announced. I haven’t heard of production starting yet, so I suspect if the US version flops, then it will be a ‘non-core’ promise. So alocal version will be made anda ir after the US series?? Or will they first test how the US version rates and then decide? ?